Here are SmashPad’s Top 10 Games of 2017. What a year it has been for this industry with so many great games releasing that most of us here at SmashPad could barely keep our heads above the rising tide of 2017 games. We could probably do a Top 30 list and still feel like some great games missed the cut. 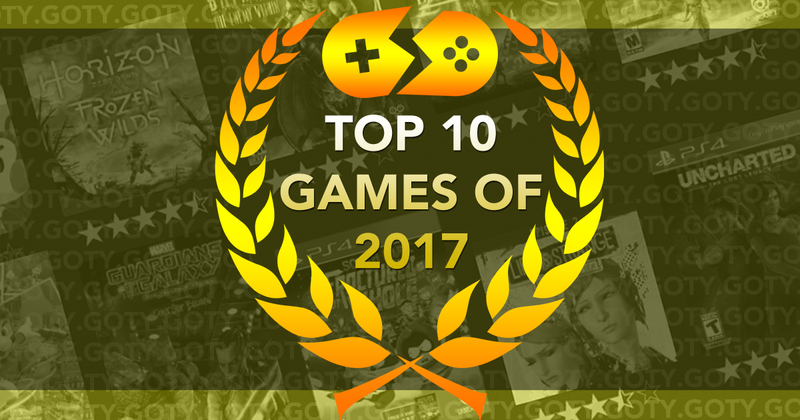 In fact, we had 37 total games across all of our individual lists, so there were quite a lot of great games that we were able to enjoy this year. I would also say that we could easily do a Top 30 list of the games in 2017 that we wished we had the time to play since so many of these games on our lists were 30 to 100 hours long depending on how much you wanted to play them. It’s been that kind of year for everyone that enjoys games. The biggest surprise about our list this year is that this is the first year in a long time that we’ve not had a portable game somewhere that prevented us from having videos of all ten games, which seems to suggest that consoles and PC have really taken control of the development landscape and that the Switch has largely diminished the impact that the few noteworthy 3DS games could have had on our lists. That’s not to say they were bad, but it seems clear where things are heading for the 3DS with the Switch’s dominance that we haven’t seen from Nintendo since the DS and Wii. The best thing about 2017 is that all three of the major platform holders are doing really well right now with Sony’s PlayStation 4 hitting 70 million units at a great pace and even their PSVR hitting 2 million units in just over a year to be a surprisingly big seller among the various VR options. Microsoft has mostly righted their Xbox One ship with the Xbox One S cleaning up during the holiday season and the Xbox One X seeming to sell pretty well for a $500 console releasing four years after the original launched that was sitting next to a $190 cheaper introductory Xbox One for most of its life so far, though Microsoft stopped talking about sales numbers a few years ago that makes it hard to know how well they’re doing this year. Nintendo was probably the biggest surprise among all three since they came in with this weird hybrid system that everybody thought would be suffering from an extreme, intentional shortage, but the numbers suggest otherwise as they have nearly eclipsed the Wii U’s lifetime numbers in the first year of the Switch’s life to right that ship really quick. Everything is peachy for all three platform holders right now, which is great for developers, publishers, and gamers. Except EA, but we’ve spent too much time this year talking about them.